for a Radio Jet in an Active Galaxy" in the journal Nature (Marscher, A.P., et al., 2002, vol. 417, pp. 625-627, 6 June 2002 issue). of the data, was made by Cosmovision, a group led by Dr. Wolfgang Steffen of the Instituto de Astronomia, UNAM, Ensenada, Mexico (see below). Note: All images, movies, and figures presented here are copyrighted. However, publication or exhibition in the news media as well as public or private viewing for educational purposes is fair use and does not require permission. Any publication of the images or movies in a scientific paper, book, or textbook requires written permission by the authors, which they will generally grant if the source of the material is indicated in the publication. The PDF file of the Nature paper is copyrighted by Nature Publishing Group. Unauthorized reproduction of the paper is prohibited; requests for permission to use the material in the paper should be sent to permissions@nature.com. Send other permission requests to Prof. Alan Marscher, who will refer you to the appropriate copyright holder. The work described here was funded in part by NASA and the National Science Foundation; however, the processing of the data and interpretation are the responsibility of the authors and do not necessarily represent the views of either agency. Here is a June 2002 press release from Boston University; we have changed the title. (Boston, Mass.) - Active galaxies have been a mystery ever since they were discovered in the 1950s. They radiate energy equal to the brilliance of thousands of ordinary galaxies, and some also send out twin jets of highly energetic matter from their centers. For half a century astronomers have been asking what is going on in the core of active galaxies that they throw out so much energy. Boston University astronomer Alan Marscher, leading a three-year international study of the active galaxy "3C 120," has published an answer in the current issue of Nature. "The jets in active galaxies," Marscher reports, "are powered by disks of hot gas orbiting around supermassive black holes." The study provides the first direct observational link between a supermassive black hole and accompanying jets of rapidly moving particles. Active galaxies were first identified in the 1950s when early radio telescopes found that certain galaxies emit strong radio signals. Something very exotic had to be going on in those galaxies to produce the energies needed to emit the signals. As researchers developed new tools that made it possible to see across the entire electromagnetic spectrum - infrared and ultraviolet emissions, X-ray and gamma ray sources - astronomers found active galaxies also to be strong emitters of other radiation. This was more evidence that some kind of extremely energetic process had to be at work.Scientists have long thought that matter falling into supermassive black holes might be the power source of active galaxies. That hypothesis was strengthened by astronomers' recent understanding of microquasars, objects that show characteristics similar to active galaxies but which are less massive and also much closer to the earth. Being closer - only thousands of light years away - microquasars have been observed with greater resolution and detail than has been possible with active galaxies up until now. The active galaxy 3C 120 is 450 million light years away. The supermassive black hole the researchers expected to be at its core would have the mass of at least 30 million stars, yet would be squeezed into a region smaller than the distance between the earth and the sun. The tremendous gravitational force of this mass would continuously attract more matter, which would spiral around the black hole into a thin doughnut-shape called an accretion disk. 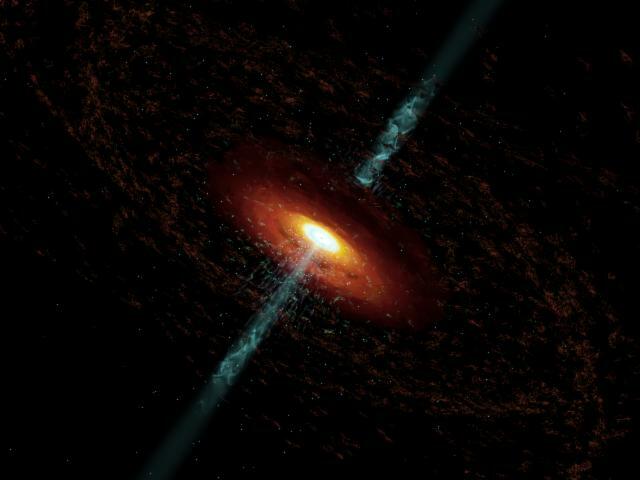 In the microquasar model, the rapidly moving and extremely hot matter of the accretion disk generates electromagnetic forces, and the interaction of these forces with the disk gives rise to the extremely energetic jets of matter thrown away from the black hole. The researchers expected something similar to take place at 3C 120.
in St. Croix in the Caribbean, and eight more spread across the continental United States - that are linked together to act as a single, giant receiver. Three years of observations recorded four instances of a phenomenon very similar to what has been seen in microquasars. The phenomenon begins when X-rays emitted by the accretion disk become dim. "What we are likely seeing," says Marscher, "is the inner part of the accretion disk becoming unstable and suddenly plunging into the black hole. We detect a 'dip' in the X-ray flux as the hot gas in the disk disappears after it falls past the event horizon of the black hole." Not all of the inner disk, however, gets swallowed by the black hole. Electromagnetic forces channel some of the remaining hot matter into the jets venting straight out from the center of the galaxy. "We see it," explains Marscher, "as a knot of radio emission shooting away from the black hole." The researchers recorded an extremely bright radio source moving at what appears to be several times the speed of light along the jet of particles streaming out from the center of 3C 120. All the while, the accretion disk is continuing its accumulation of more matter. "About ten months later" - the average time between the events the researchers recorded - "something disturbs the accretion disk orbit, and," Marscher concludes, "the whole thing flushes and blows again." Marscher is lead author of the report, "Observational Evidence For The Accretion-Disk Origin For A Radio Jet In An Active Galaxy," which appears in the June 6, 2002, issue of Nature. In addition to BU's Jorstad, who is also associated with the St. Petersburg State University, Russia, the other co-authors are Margo Aller, of the University of Michigan; Matthew Lister, of the National Radio Astronomy Observatory; Alastair Stirling, of the University of Central Lancashire, England; Harri Terasranta of the Helsinki University of Technology, Finland; and Jose-Luis Gomez, of the Astrophysical Institute of Andalucia in Granada, Spain. The research was funded by NASA, the National Science Foundation, and the Fulbright Commission. This quasar-like "active" galaxy is essentially a scaled-up model of the so-called microquasars within our Milky Way galaxy, which are smaller black holes as massive as about ten suns in a solar system with a normal star. This means that scientists can now use their close-up view of microquasars to develop working models of the most massive and powerful black holes in the universe. These results -- published in the June 6 issue of Nature and announced today at the American Astronomical Society meeting in Albuquerque, N.M. -- are the fruit of a three-year monitoring campaign with the Very Long Baseline Array, a continent-wide radio-telescope system operated by the National Radio Astronomy Observatory, and NASA's Rossi X-ray Timing Explorer. Marscher and his colleagues have established the first direct observational link between a supermassive black hole and its jet. The source is an active galaxy named 3C120 about 450 million light years from Earth. This link has been observed in microquasars, several of which are scattered across the Milky Way galaxy, but never before in active galaxies, because the scale (distance and time) is so much greater. The jets in galaxy 3C120 are streams of particles shooting away perpendicularly from the plane of a black hole's accretion disk, moving at 98 percent the speed of light. In microquasars, radio-emitting features become visible in a jet shortly after X rays from the accretion disk get dimmer -- as if the accretion disk suddenly flushes into the black hole and disappears, fueling the jet. These radio "blobs" then appear to move at faster than light speeds, an illusion caused by their ultra-high speeds. Joining Marscher on this observation and analysis are Svetlana Jorstad of Boston University; Jose-Luis Gomez of the Astrophysical Institute of Andalucia in Granada, Spain; Margo Aller of the University of Michigan; Harri Terasranta of the Helsinki University of Technology; Matthew Lister of NRAO; and Alastair Stirling of the University of Central Lancashire, England. The research was supported by both NASA and the National Science Foundation. The research of Dr. Gomez was supported by the Spanish Direccion General de Investigacion Cientifica Tecnica. The Spain-US collaboration was supported by the Fulbright Commission. The data are presented below. The top panel shows the X-ray flux (brightness) as a function of time measured with RXTE. The red points correspond to what we call the X-ray dips, when the flux was low for at least 4 consecutive observations. The blue arrows show the times when a bright spot first showed up on the VLBA radio images (see the next figure below), about 0.1 years after each X-ray dip. The middle panel is the slope of the X-ray spectrum (of interest mainly to astronomers); a low value means that the higher frequency X-rays are more prominent relative to the lower frequency X-rays. The bottom panel shows the flux at 3 radio frequencies (green is 14.5 GHz, red is 22 GHz, and blue is 43 GHz) obtained at the University of Michigan Radio Astronomy Observatory and the Metsahovi Radio Observatory in Finland. The black points on the bottom indicate the flux of the radio core as seen on our 43 GHz VLBA images. The figure below presents a sequence of VLBA images (year of observation in decimal form marked on the left) at a frequency of 43 GHz. The scale is in milliarcseconds (mas). The apparent diameter of the moon in the sky is about 1.8 million mas, which means that the resolution of the VLBA is extraordinarily fine. There is a stationary "core" at the left (which is east - on astronomical photos, east is to the left and west to the right). You can see bright spots coming out at speeds of about 1.8 mas per year, or between 4 and 5 times the speed of light. (At the distance of 3C 120, 1 mas corresponds to a length of 0.7 parsecs = 2.3 light-years.) The diagonal lines pass through the centers of the bright spots. Of course, this sort of contour map is not very picturesque, so Jose-Luis Gomez has made a movie based on our VLBA data. MOVIE!! that you can play with Apple QuickTime. In case you don't have QuickTime, you might be able to play the following versions of the movie in .avi format: easily downloadable 2.7 Mbyte version or a high-resolution version (45 Mbyte .avi file). The movie illustrates what we think is going on outside the black hole of 3C 120. This is an animation (not from real data) created by Cosmovision*. The supermassive black hole (with a mass of about 30 millions times that of the sun, which corresponds to an event horizon that is about 3 times smaller than the size of the Earth's orbit around the sun) is just a very tiny black dot at the center. Surrounding it is an accretion disk of gas and dust from interstellar space that is slowly falling into the black hole while rotating around it in nearly circular orbits. (Despite the black hole's strong gravity, the gas has too much inertia because of the rotation of the disk to fall directly into the black hole. Instead, it swirls around until a process similar to friction slows it enough to fall past the event horizon.) The accretion disk contains a magnetic field that is twisted by the rotation (which is faster closer to the black hole). ANOTHER MOVIE! (2.2 Mbytes, AVI format). This one was made by Dr. Jose-Luis Gomez from the real VLBA images of the radio jet at a frequency of 43 GHz. It shows the radio brightness of the jet as contours (the inner contours correspond to higher brightness) and the color-coded contours represent the intensity of polarized radio waves. Strong polarization indicates well-ordered magnetic fields (the sticks are in the direction of the magnetic field). Note how the bright "knots" appear and move down the jet, with their polarization changing. The red area with the black center represents the accretion disk with the black hole at the center. The curve shows how the X-ray brightness changes with time. When the X-ray brightness decreases, the dark part of the accretion disk becomes larger, which we think is when that part suddenly falls into the black hole. About 4 weeks later, the starting point of the jet gets bright and a new superluminal knot moves down the jet. Back to the movie...The part of the accretion disk that is very close to the black hole is so hot (from the friction-like processes driven by the gravitational infall) that it is a very bright source of ultraviolet rays. Some of these UV photons are scattered - reflected in random directions - by hot electrons that are in a "corona" above the disk. It is these X-rays that we observed with the Rossi X-ray Timing Explorer (RXTE). When the inner disk changes - perhaps a chunk of it falls into the black hole or its temperature drops when it becomes less turbulent - the UV radiation and therefore the X-rays become momentarily dim; in the movie, a black spot appears at the center. Shortly thereafter, you see a bright spot moving down the jet (at an apparent velocity of almost 5 times the speed of light!). This is actually brightest at radio frequencies. In order to observe it we need the super resolving power of the Very Long Baseline Array (VLBA) operated by the National Radio Astronomy Observatory (NRAO). *COSMOVISION is a project to produce scientific and didactic visualization of astrophysical objects and processes by way of 3D-animations. Using methods similar to those applied in the production of documentaries and feature films, they put emphasis in scientific and didactic rigor. They can combine physical computer-simulations with conceptual animations to present scientific results in a wholy new fashion. The research group is based in Mexico. Cosmovision's motto is: "If we can't go to the stars, we bring them to your home." We were awarded 500,000 seconds (about 6 days) of observing time on the INTEGRAL satellite to try to detect the electron-positron annihilation line toward 3C 120. If, as many theories and observations suggest, the jet is composed mainly of electrons and positrons (anti-electrons) as opposed to the electron-proton make-up of "normal" matter, then our calculations indicate that an emission line should be detected at an energy of 495 keV. This is lower than the energy of 511 keV seen in laboratories on Earth because of the redshift of 3C 120, z=0.033. [Energies and frequencies are lowered by a factor of (1+z) because of the expansion of the universe.] The emission line comes from the positrons colliding and annihilating with electrons in the interstellar medium. This should occur in 3C 120, since the jet seems to be interacting strongly with the interstellar gas as the jet propagates through the galaxy. Various lines of argument suggest that positrons may greatly outnumber protons in jets: how much energy is transported out of a radio galaxy by its jets, how to explain X-rays from jets on scales of hundreds of kiloparsecs, and the observed levels of circular polarization on parsec scales without too much Faraday depolarization. But there are ways out of each of these even if the jets contain mostly normal matter. Our INTEGRAL observations did not detect the annihilation line at a significant level. That is, the line is 1 standard deviation above the noise. From this, we can say that the number of positrons produced per second in the jet is less than 2x1050. Working with us on this project are Ian McHardy (U. Southampton, England) and Jose-Luis Gomez (Instituto de Astrofisica de Andalucia, Spain). We performed (PI: Jose-Luis Gomez, Instituto de Astrofisica de Andalucia, Spain, with A. Alberdi, C. Garcia-Miro, I. Agudo, J.M. Marti, and J.M. Ibanez) monthly polarimetric VLBA observations of 3C 120 at 43 and 22 GHz over 16 epochs. The sequence of radio images (along with a movie of the 22 GHz evolution, although you can also view this below) of 3C 120 reveals a region in the relativistic jet where superluminal components flash on and off over time scales of months, while the polarization angle rotates. This can be explained by interaction between the jet and an interstellar cloud located about 8 parsecs from the center of the galaxy. The cloud, which rotates the polarization direction and possibly eclipses a section of the jet, represents a "missing link" between the ultradense broad-emission-line clouds closer to the center and the lower density narrow-emission-line clouds seen on kiloparsec scales. Here is a 43 GHz movie of 3C 120, made by Jose Luis Gomez from an interpolation of VLBA images. Beware - it is large (77 Mbytes).